In 2011, the Ringside Fish House opened downtown, on the second floor of the Fox Tower. The space had previously housed Ringside Steakhouse during their extensive remodel. It overlooks Director’s Park, and in the evening when the shades go up, it’s fun to watch the lights dance through the glass canopy, occasionally with startling effect, such as clouds drifting by, or trees blowing in the wind. 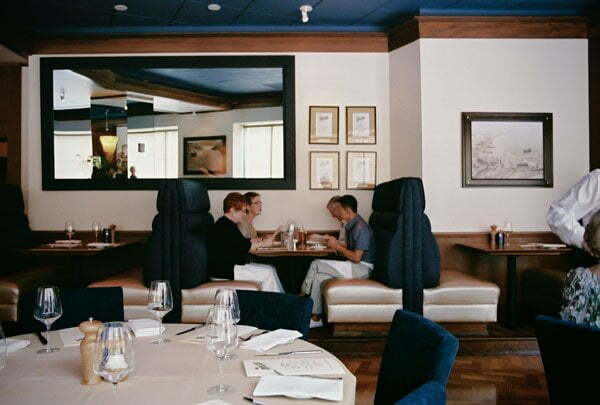 The Fish House is sleek and modern, with clean lines, high-back booths, and a plush feel. Like every restaurant, some tables are better than others, and conversation at those towards the middle of the dining room is difficult on busy nights. The space is elegant and upscale, though during the day when you can see the 250 seats, it has a corporate feel. If the lights were dimmed a bit in the evening, it would be a cozier and a little less Palm Springs. When the sun is low, the glare through the windows can be a bit overwhelming. One early evening it was blazing into the dining room; we could hardly read our menus. A server came by and said, “wow, that sure does glare in your eyes!”, and walked away. Overall the restaurant feels more comfortable after dark, so keep that in mind. The menu is billed as “American Contemporary”. Though the restaurant is primarily focused on fish, you will also find a selection of meat dishes, such as prime rib, or rib eye steaks. If you want to drop by to check the place out and have a few drinks, there is a large, separate lounge. The happy hour is one of the most popular in town. House specialty cocktails and wines by the glass are $2 off, beer on tap $1 off. 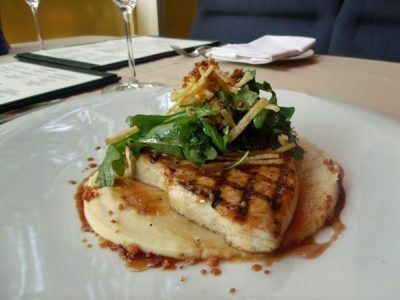 Most of the food is better than average restaurant happy hours – the small plates are $2.25 to $5. Try the steak bites or the fish tacos. The bar frequently fills on weekday and weekend afternoons, so plan accordingly. The wine list is good, as you would expect for a restaurant associated with Ringside Steakhouses. The selection is vast – over 600 labels, representing many regions. A large group of by-the-glass pours are available. However, there are a few glitches. One evening I dropped into the bar for a glass of the house wine. The server remarked that the house cabernet was really good, and had come in that afternoon. I wouldn’t argue that – it was good, and it was still at least 75 degrees from the truck. Oh, and at $14.00, a bit spendy for a house wine. Next time I’ll look at the list instead of just taking their recommendation. Cocktails are $8 and up. I’ve tried both a gin & tonic, and an old-fashioned. They were of typical restaurant quality – okay, but not very well-crafted, especially the old-fashioned, which takes a deft hand. When the restaurant first opened, the service was excellent, without a single misstep. However, my most recent visits were not nearly as polished. One night the server seemed particularly confused. Throughout the meal, dishes were placed in front of the wrong people, then the wrong tables. On another evening the pacing was off, and we sat and watched our server visiting with other patrons, while we waited to order. It also took too long between courses. To add insult to injury, the check was incorrect, and, once again, as our server was fawning over patrons at a nearby table, it took 15 minutes to get his attention. Note to management: if you undercharge me, and I damn near need to stand on a chair and sing an aria to get it corrected, perhaps you should at least apologise; it was a $50 error in my favor. Starters are some of the best choices. The thin pommes truffle frites are covered with a rather gooey hollandaise, but not in a bad way. They are a bit soggy, yet addictive, and have a slight truffle flavor ($9). The onion rings are the same as those offered at Ringside Steak House, and are just as good. I almost always get a small order, which can easily be split among three people ($8.50/$9.75). The steak tartar appetizer is also pretty good, paired with Oregon truffles, a quail egg yolk and brioche ($14.25). Unfortunately it pales when compared to other restaurants in Portland. Though there are a few missteps, the salads are just fine, and will cost you between $8 – $12.25. The uninspired “baby mixed greens with pecorino toscano, hazelnuts and sherry-mustard vinaigrette” was fresh, but overdressed and over-salted. A better choice was the grilled romaine ‘BLT’ with house-made bacon, cherry tomatoes and garlic croutons – a take on a classic sandwich deconstructed. Though the romaine could be grilled longer to bring out the flavors, the sweet cherry tomatoes taste like they’ve had a quick sauté in bacon fat, and both the avocados and the crispy bacon are good. The garlic croutons are boring, but at least they don’t seem to be of the boxed variety. Overall the salad is an interesting take, and I enjoyed it. Most of the other choices are of the basic steakhouse variety – iceberg wedge, butter lettuce, and a Caesar. One evening I tried the soup du jour. It was a red pepper purée with a bit of crab on top, creamy and warming, the crab a nice counter to the pepper $8. Ringside servers frequently refer to the Alaskan halibut as the specialty of the house, so I’ve ordered it several times. A few months after they opened, it was slow-roasted with potato gnocchi, andouille sausage, Manila clams and an orange reduction. The fish was properly cooked and moist, yet the real flavor was the overwhelming amount of salt. 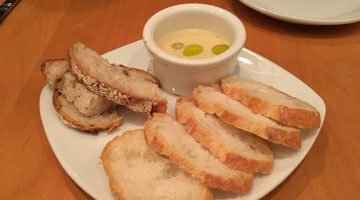 The accompaniments added a nice combination of ingredients, but the only thing that blew me away was the price – $32. On a much more recent visit, the halibut was pan-roasted with morels asparagus, pancetta and a shellfish beurre blanc. I’ve had many similar preparations for less money that were better, and even worse, the price had jumped to $36.50. From the menu description the halibut always sounds like it is going to be good, but turns out to be average. The “Johnston County ham-wrapped Idaho golden trout with Dungeness crab, heirloom melon, almonds, and cinnamon yogurt” is an interesting dish, but it too is fatally marred by a heavy hand with the seasoning. The ham, which is nicely wrapped around the fish, is quite salty on its own, and coarse sea salt is sprinkled across the top. That’s about all I could taste. The accompanying ingredients are in such small quantity that they look artistic, but don’t add a lot to the flavor, save an occasional burst. Unfortunately, on another visit months later, the same issue occurred with a different version of the fish. The trout was dressed minimally, and draped over a bed of rice. The meat was moist, the skin thin and slightly crispy, but this version was also strongly over-salted ($26). Other fish dishes have followed this same pattern – over seasoned, generally boring, and frequently overcooked. I can’t let this review go by without mentioning the scallops, specifically the Chef’s Special “seared dayboat scallops with andouille sausage jambalaya, herbed basmati rice and Dungeness crab butter”. To me, scallops are delicate – best without much adornment – sear them quickly and get them in front of me. Add all of these other ingredients and they just become a muddle, where the scallops become a vehicle for the sauce. It just doesn’t make sense ($32). Though Ringside is billed as a fish house, I thought I’d see if they fared any better with meat, and ordered a smoked pork loin. It looked good, a nice portion, fanned across the plate with a bit of sauce. Unfortunately, it wasn’t. I actually recoiled at the first bite; the sauce, which reeked with the liquid smoke flavor, was just awful. Everything else was, once again, over-salted. I literally had to take the time to scrape sauce and salt off before I could get the pork down ($27.50). Desserts are an obvious afterthought in desperate need of improvement. An order of madeleines were accompanied by slices of peaches which had the flavor of the canned variety, along with a wedge of mascarpone which also didn’t have much flavor ($9). A sour cherry pie had one of the worst crusts I’ve had in ages, close to cardboard in texture and taste. The cherries were just ok – not a lot of flavor ($9). Sorbet and ice creams are better choices. I was told they are made in-house ($6). Both go well with the plate of cookies, which are heated, moist and flavorful ($6). If you order before 6pm, you’ll have the option of the “Theater 3-Course Dinner Special” for $35. It consists of your choice from a list of lobster soup or baby mixed greens, five different entrees, and two desserts. On Sundays the special is available all evening. I want to like Ringside. The space is upscale and nice, it can be romantic, and is definitely a good place to take business associates. Unfortunately, the dishes are just average, and nothing stands out enough to make me want to return. Then there is that pesky salt problem. Overall, Ringside Fish House is a ‘C’ restaurant at ‘A’ prices. Reservation Policy: Recommended. Open Table or call.